A Really Romantic Recipe: You’ll Have to . . .
. . . provide the suspense. 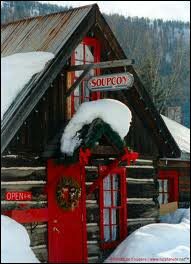 After a lovely day hiking around Crested Butte, Colorado, Dave took me to a charming restaurant called Soupcon, housed in an old miner’s cabin off Elk Avenue. Pan Seared Scallops Drizzled with Warm Tomato Beurre Blanc Served on a Bed of Green Goddess-Dressed Mache with Fried Yukon Gold Potato Toothpicks. I know it looks like a lot of steps, because, well, it is a lot of steps. None of them are that hard, and you can start on this the day before by making the Green Goddess dressing and the warm tomato beurre blanc. The next day, you’ll only have to warm up the tomato beurre blanc, flash-fry the potato toothpicks, toss the mache with the dressing and sear the scallops. Soupcon served this salad with a chilled rose wine made with Sangiovese grapes only. Ask your wine merchant for it, because this is important. Finally, this is a very rich dish. Chilled melon is a great desert, but that night I served it with Ciao Bella Orange Sorbet in crystal glasses garnished with a sprig of mint and thin chocolate wafers ( yes, the ordinary Nabisco kind you can find in the supermarket) just to be a little fancy and well, romantic. Okay? 1. Combine all ingredients in a bowl. Cover and refrigerate for at least a half an hour. 1. Soak tomatoes in warm water for a half an hour. Drain, pat dry and mince. 2. Stir together the tomatoes, the softened butter and salt. Form the mixture into a 8-inch log on a sheet of wax paper and chill, wrapped in the paper, until firm, about an hour. 3. When the butter-tomato mixture is chilled, cut it into 12 equal pieces. 4. Cook shallot in one piece of butter (Keep the remaining butter chilled) in a small, heavy saucepan over moderately low heat. stirring until softened, about 3 minutes. Add the wine and boil until the liquid is reduced to about 1/3 cup. 5. Reduce heat to low and whisk in the remaining cold butter, one piece at a time. adding each piece before the last one has completely melted. Do not let the pan get hot enough so that the butter mixture separates. Whisk in the water and lemon juice. Season with salt and pepper. 6. Process butter mixture in a blender until it is smooth. At this point, you can refrigerate the sauce overnight. When you reheat it, do so over very low heat stirring constantly so the sauce does not separate. FYI: You can use this sauce unprocessed over grilled salmon and it’s great! Ready to finish the dish? 1. Right before you begin step three, have the amount of mache you intend to use (enough per person to fill the middle part of a dinner plate for each) washed, dried and in a chilled bowl. Have the dressing sitting right next to it with the tongs. Warm the beurre blanc, stirring constantly. Keep warm on a flame tamer on the stove or in a bowl of hot water. 2. Right after you fry the potatoes, be ready to sear the scallops. 1. Slice potato very thin. You’ll need about six slices for two people. 3. Pour canola oil into a 10 inch frying pan to a depth of about an inch. Heat until a potato matchstick turns golden really quickly. 4. Now you have to work fast. Drop some of the potatoes into the pan and remove with tongs as soon as they are golden but before they get dark! Just so you know, I asked Dave at the restaurant if I could skip this and he said NO! 1. Allow four large sea scallops per person. Wash and dry scallops. (Really dry them on paper towels!) Sprinkle with salt and pepper. 2. In a 12 inch saute pan, pour enough canola oil to coat the bottom and heat until quite hot but not smoking. Add the scallops and cook for 4 minutes on one side. Turn them with tongs and cook for one more minute. That should do it. Okey Dokey. You’re ready to assemble the dish. This is the part where you look like a complete domestic goddess. Have your husband or (by now your totally impressed) guest or boyfriend open the chilled wine and carry it to your already set table. I didn’t need to tell you that probably, but you never know. Tell him to light the candles. 1. Right after you put the scallops in the pan, toss the mache with the smallest amount of dressing you think you’ll need. You can always add later. Be sure not to overdo the dressing! Taste and put the dressed mache on dinner plates. 2. Make a little well in the dressed greens and insert a bundle of potato toothpicks as if they were a sheaf of wheat or maybe pickup sticks! 3. The minute the scallops are done, place them on the lettuce around the potato sticks. 4. Drizzle a couple of teaspoonfuls (no more—it’s all about balance) of warm beurre blanc on top of the scallops. Now when I go back to Crested Butte to cross country ski, I’ll see what kind of inspiration I can find at Soupcon for a romantic winter dinner! 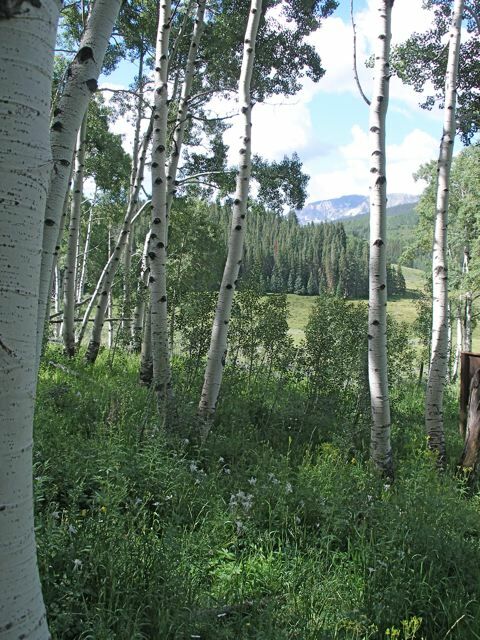 Tags : Colorado, Crested Butte, Pan Seared Scallop Salad Recipe, Romantic Dinner, Soupcon Restaurant | Comments Off on A Really Romantic Recipe: You’ll Have to . . .
All novels, and Romantic Suspense Novels are no different, start with characters. Period. Characters. The reason my books sell is because they are about characters. Most novels I read are about ideas in search of characters. I’d venture to say that if you’re not a writer, you haven’t read these kinds of novels. They don’t get published. If you’ve been in writing workshops, if you’ve gotten an MFA, you’ve read a ton of them. Hey, some of the ideas are really cool, but . . . vague. You know? No characters. You’re going on a journey when you read. You need a guide. Sometimes that guide is just a voice, but it’s a character’s voice. For me though, my books start with setting, with place. A few years ago, I took a workshop on Story Structure with Robert McKee, a famous screenwriter whose past students include 21 Academy Award winners and 141 Emmy award winners. Here’s a Youtube link of Mckee on setting: http://wn.com/Story_Seminar. I’m including this just so you’ll see what goes on in my mind, what I think is fun. Just imagine yours truly as one of the eager faces in the crowd. In the Youtube he stresses the importance of setting to characterization and plot. 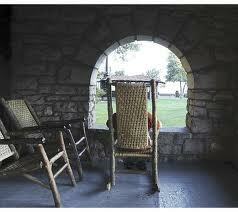 Setting, he tells us, imposes creative limitations. A place will have certain characters. A funky beach town on the west coast of Mexico has certain characters. Right now that’s my creative limitation. I really love all stages of crafting novels—in my case Romantic Suspense Novels—and right now I’m working on a new draft of an old novel Bird of Paradise. A new character just inserted himself into my story, and I have to do the whole thing all over again. I’m back at the very early stages of developing a character and, depending on what he does and who he is, the plot will develop. It was perfect timing actually, because Dave and I just took a long road trip through Utah and Colorado and Arizona. We stayed at lodges and hiked during the day. A fabulous vacation. 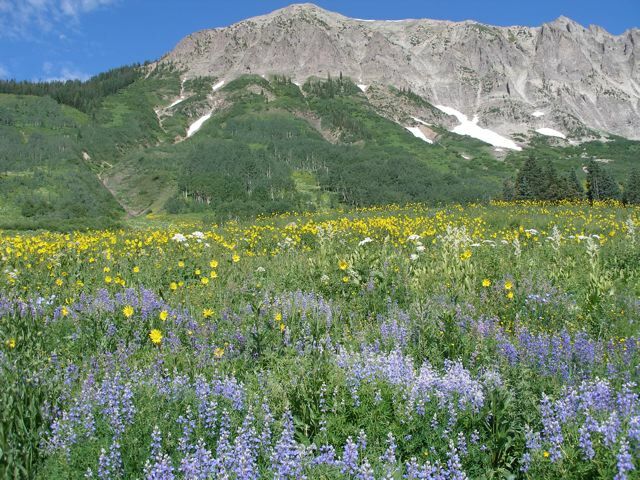 Just look at the fields of wildflowers near Gothic, Colorado!. 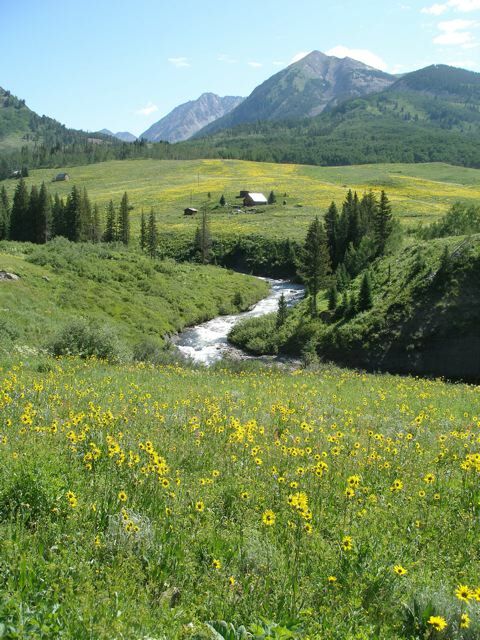 There’s nothing like hiking at 10,000 feet—maybe it’s the shortage of oxygen—to put you in a trance-like state for drafting. 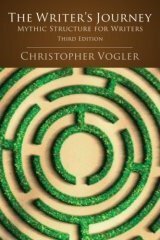 Another thing I kept in mind as I hiked in the mountains was Christopher Vogler’s four-act story structure. It’s based on the work of Joseph Campbell in which, like the old myths, the beginning of the character arc is the Call to Adventure. In Vogler’s paradigm, Act One ends with Crossing the Threshold. Anyway, there’s nothing like lying awake in the middle of the night in a room that has no personal attachment for you, the blackout curtains pulled and the air-conditioner droning, for creating your character, for beginning the Call to Adventure. Nothing like sitting in a rocking chair on the porch of the El Tovar looking out over the Grand Canyon to get you thinking about Crossing the Threshold. When I started this blog, I swore I wouldn’t write about writing. BO-RING for most people. I’m just including this little glimpse into my reality…kind of like a potter showing you what the clay looks like in it’s glob-like form. Next week, I’ll give you a recipe. Something you can use. Seared scallops drizzled with warm tomato beurre blanc on mache tossed with Green Goddess dressing and a garnish of fried potato “toothpicks”. It’s what I had for my birthday dinner at Soupcon in Crested Butte, Colorado. I came home and reproduced the dish.